NEW YORK, Jan 7, 2014/ — We might have a Polar Vortex going but Super Bowl XLVIII just heated up with 48 haute helmets being created by 48 designers to celebrate the first ever Football Sunday to be played outdoors in a cold weather environment. Created in partnership with Bloomingdale’s, CFDA and the NFL, the 48 one-of-a-kind Super Bowl XLVIII helmets will be auctioned off to benefit the NFL Foundation. Designers who are participating in this unique collaboration are: Alejandro Ingelmo, Alexis Bittar, Ariel Ovadia and Shimon Ovadia for Ovadia & Sons, Betsey Johnson, Billy Reid, Blake Mykoskie for Toms, Bloomingdale’s, Catherine Malandrino, Cynthia Rowley, Cynthia Vincent for Twelfth Street, Dana Lorenz for Fenton/Fallon, Danielle Snyder and Jodie Snyder for Dannijo, Dao-Yi Chow and Maxwell Osborne for Public School, David Neville and Marcus Wainwright for Rag & Bone, Dennis Basso, Diane von Furstenberg, Donna Karan for Donna Karan and DKNY, Eugenia Kim, George Esquivel, John Varvatos, Junkfood, Keren Craig & Georgina Chapman for Marchesa, Kenneth Cole, Lela Rose, Mark Badgley and James Mischka for Badgley Mischka, Mark McNairy, Michael Bastian, Monique Lhuillier, Narciso Rodriguez for Narciso Rodriguez Studio, Nicole and Michael Colovos for Helmut Lang, Nicole Miller, Olivier Theyskens for Theyskens Theory, Gela Nash & Pamela Skaist-Levy for Pam & Gela, Pamela Love, Rachel Zoe, Rebecca Taylor, Richard Chai, Rogan Gregory and Scott Mackinlay Hahn for Loomstate, Rogan Gregory for Rogan, Rozae Nichols for Clover Canyon, Sam Shipley and Jeff Halmos for Shipley & Halmos, Stacey Bendet for Alice + Olivia, Stephen Dweck, Steven Alan, Tadashi Shoji, Todd Snyder, Vince Camuto, and Yigal Azrouel. “We are excited to team up with Bloomingdale’s and the CFDA to auction off designer Super Bowl XLVIII helmets to support the work of the NFL Foundation,” said Natara Holloway, the NFL’s vice president of consumer products. Fans may visit Bloomingdales.com/superbowlhelmets to access NFL Auction and bid on the designer Super Bowl XLVIII helmets from January 15 – February 4, with 100% of the net proceeds benefiting the NFL Foundation, a non-profit organization dedicated to improving the lives of those touched by the game of football. Through its grant programs the Foundation supports youth and high school football programs, health and safety efforts, as well as community health initiatives, including NFL PLAY 60. The minimum bid for each helmet will be $248, celebrating the 48th Super Bowl which is taking place across two states. 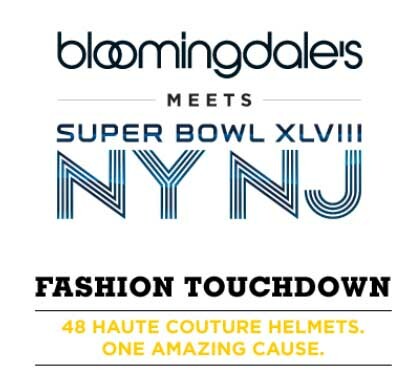 The helmets will be unveiled in the iconic Bloomingdale’s 59th Street windows on January 15 at 5:00pm.